Nowadays more and more people are installing gas appliances. These appliances are the answer to homeowners’ need for affordability, because they consume less energy than some of their electric counterparts. In this case the proper installation, operation and maintenance of gas lines becomes of primary importance for the home or business owner. At Norwalk-La Mirada Plumbing Heating & Air Conditioning we deal with installation, maintenance and repairs of the gas lines at your residential or commercial property and do our job according to the highest standards. Corrosion, tree roots and soil shifts can harm your gas lines over time. You can count on Norwalk-La Mirada Plumbing Heating & Air Conditioning to repair, replace or install new safe gas lines that won’t be hazardous for your family or workers. Small rips and holes in gas lines can gradually erode, causing serious damage as a result. Our gas specialists can detect these problems early and solve them, so that you could continue enjoying a comfortable lifestyle at your own home or business. 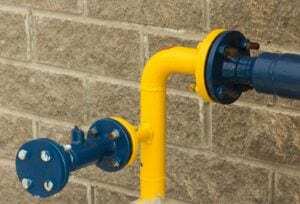 We are skilled in repairing, replacing, and installing flexible piping gas lines, propane gas lines as well as gas lines piped to various appliances. Before someone can be certified to install and service gas lines and natural gas appliances, he needs to undergo an advanced and thorough training. It helps to ensure everyone stays safe during the gas lines repair project and after. That’s why at our company we hire knowledgeable, experienced and committed professionals with certified training credentials. Our high standards are one of the main reasons we earned our reputation and continue to earn the trust of our customers, and we’ve been doing it since 1958. Our team of licensed technicians has the experience and advanced tools to maintain any plumbing job. Whether you’re looking to install or repair gas lines, hook up a new barbecue grill, plumb your fireplace, or fix possible gas leaks, we can do it all. If you suspect a gas leak, contact us ASAP. We provide 24-hour emergency service, and we’ll send a gas specialist immediately to make sure you and your family stay safe. Broken gas lines can be dangerous, please don’t risk your life or the lives of your loved ones and let Norwalk/La Mirada Plumbing Heating & Air Conditioning service your gas lines for you!